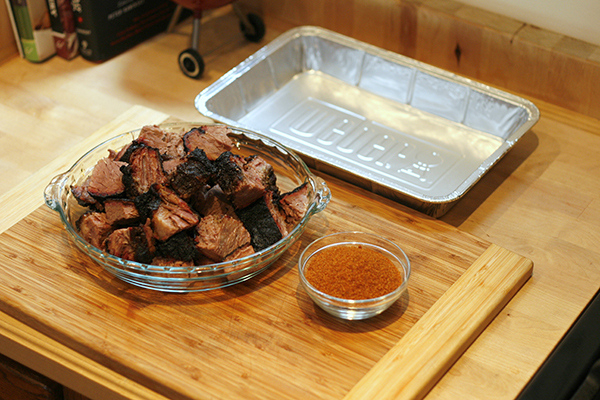 Sometimes known as “Meat Candy”, Burnt Ends are all at once crispy, smoky and nicely spiced chunks of smoked-beef heaven. Originally part of the Kansas City BBQ tradition, this is a great way to up your BBQ game when smoking a traditional brisket. Because the top muscle, called the “point”, has more connective tissue and fat than the “flat”, a longer, second cook makes it even more tender and delicious. 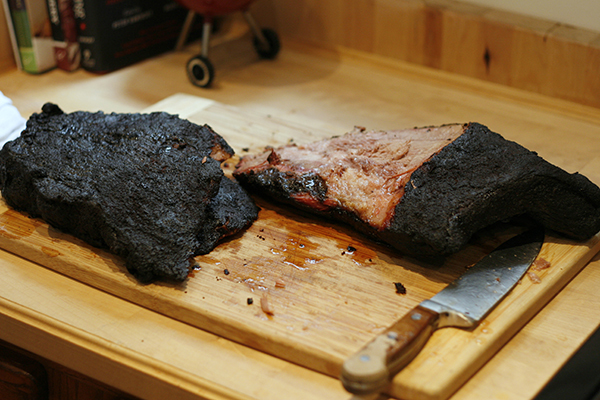 Once the brisket has been cooked to the proper temperature and rested, use the following recipe to get some tasty nibbles to serve with your BBQ feast. Use any kind of spicing you want, but remember to season lightly the second time if your spice has salt added, or the end result will be unpleasantly salty. 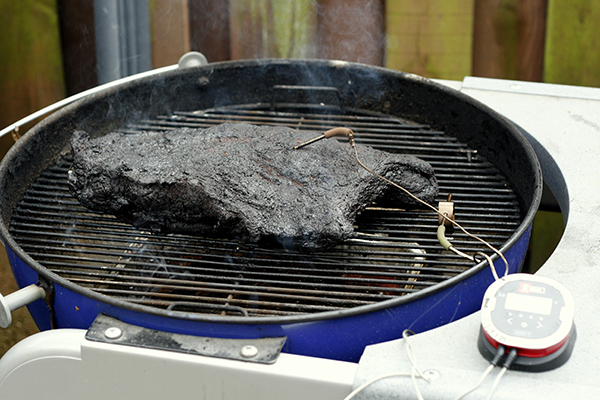 Click here and here to learn more about how to smoke a brisket. 1. Set the kettle for low, indirect grilling 250-350F, with a foil pan in the middle filled with water and the charcoal on either side. 2. 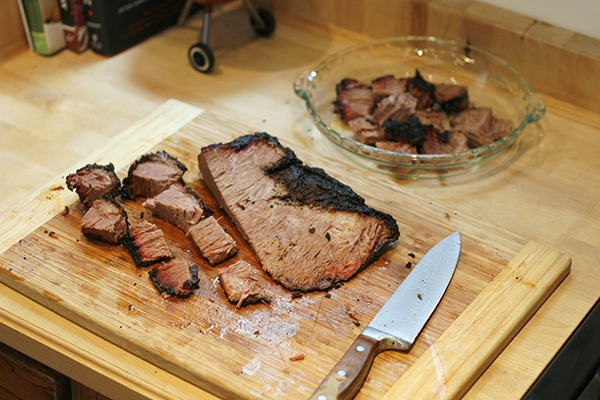 Once the brisket has rested, remove the point from the flat by cutting the brisket across the middle, separating the two muscles. 3. 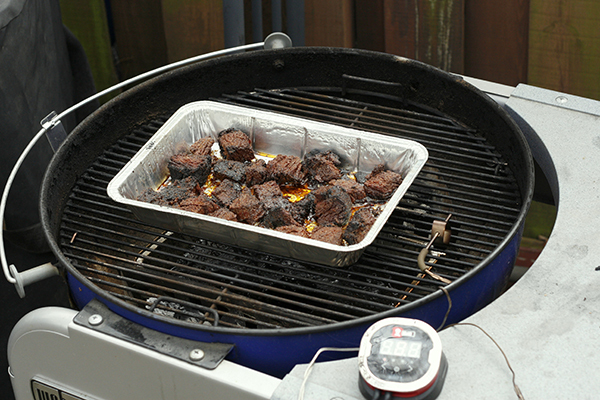 Keep the brisket flat wrapped with foil and in a warm place, if serving with the burnt ends together. 4. Trim the larger pieces of fat from the point, but try to preserve some fat, as this will help the burnt ends get a nice crust. 5. Cut the point into large cubes, about 1 ½ inches by 1 ½ inches. Try to cut them the same size as much as possible, so they will cook evenly. 6. Lightly season the meat with the BBQ spice (keep in mind, if the spice is salty, use very little). 7. Spread the meat out in one layer on the foil pans, leaving spaces between each piece. Use two pans, if necessary. 8. Set the vents of the grill to halfway closed on the top and place two chunks of cherry wood onto the coals of the grill. Close the lid and wait for smoke to appear. 10. 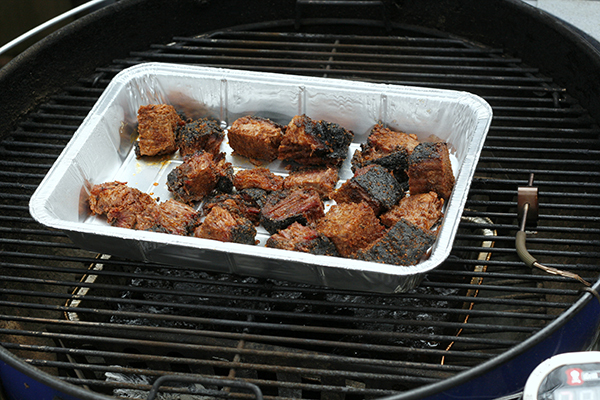 The burnt ends are done when they have a dark crust and the pieces are very soft. 11. Serve hot with your favorite BBQ sauce!